When the invite came to attend a speed-networking event in Parliament with MPs I initially said no. Doing a return trip from the North East in same day is not ideal, early start and extremely late arrival home, all for a 2-hour event. However, I have always said that apart from our own MPs, those of us in the North East don’t get much opportunity to meet with other politicians, so I changed my mind and said ‘yes’. I am now glad I did so, and appreciate the opportunity given by CarersUK and CarersWeek. The train journey down started really well with an unexpected turn of events. A young man sat a few seats from me and I recognised him as Chris Ramsey, stand-up comedian and actor from South Shields. Those that know me will not be surprised at my next actions, which was to start tweeting him. As most people travelling were using phones, he was unaware who was relating to his twitter followers what he was doing. Once I identified myself we spoke a little while. Talk about Big Brother is watching. Thanks for the laugh Chris, you were a good sport. After this light relief it was over to Westminster for the event. I was met by Carers Week staff and introduced to others from various organisations, including Age UK and Carers Trust. Then it was to business. As a Carers UK member my companions were Emily Holzhausen, Director of Policy, and Chloe Wright, Senior Policy Officer. They took turns to sit with me. Also helping oversee the event was Steve McIntosh. It was explained how the event would unfold. As MPs arrived they would be guided to tables to speak with carers, how long for was unsure, depending on if they had any other appointments they needed to attend. I had no worries about speed networking. Those that know Geordies will know we talk fast. My main concern was how much ground could be covered when the issues surrounding carers are many. It was not just about my family’s’ circumstances, but many others out there too, struggling to cope on a daily basis. As well as outlining how caring has impacted on my family, other issues discussed were as follows. 1. The issue of the Children and Families Bill and the lack of parent carer rights in it, and the concern that they would be left behind. We also talked about when the Care Bill comes to the House of Commons, to stop carers from being charged for their own services and to put an amendment, which would prevent family and friends’ support being taken for, granted. 3. The benefits system, which causes huge difficulties in trying to juggle work and care. 4. Lack of services that are right for the people we care for, e.g. lack of dementia services and support for younger people. 5. Lack of investment locally in carers’ support e.g. carer’s dementia work. 7. Concerned about the cumulative impact of different changes and cuts that are hitting families hard. 9. Impact on disabled people, as well as carers, re closure of Independent Living Fund. 10. Advice and information being hard to come by but being vital. 11. Importance of strong local advocates within local carers’ organisations. 12. The level of Carer’s Allowance and the failure of this Government and the last Government to reform this benefit. With thanks to Ian Mearns, Grahame Morris and Guy Opperman for the North East presence, to Norman Lamb who stayed longer than intended and was late for his next appt, and remaining MPs for the interest they showed, and the many questions asked. Journey back took several hours and it was past midnight when I got home, extremely tired but an enjoyable day. 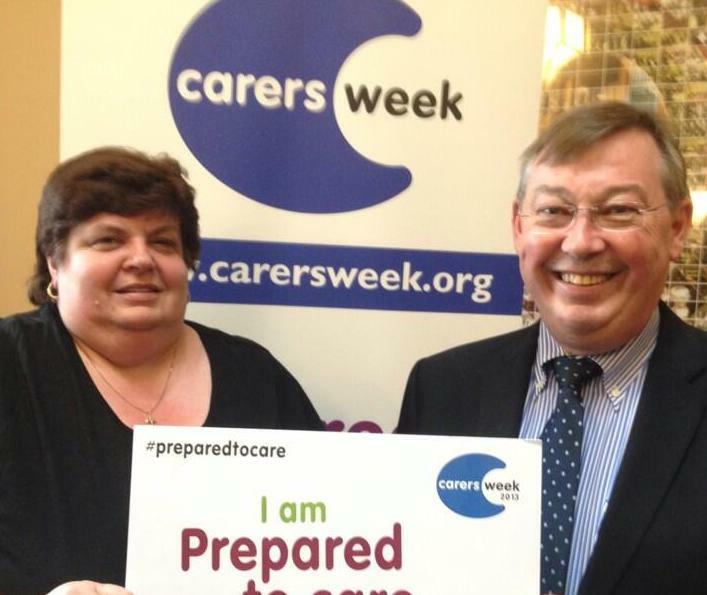 So, following on from the Carers Week theme of ‘I’m Prepared to Care’ – my question would be – What next? Many of us have already been caring for as long as we can remember. Governments past and present have failed to fully address many of the carer issues. Give us the tools to assist us in our caring roles. It may be finances, respite, services, equipment, understanding from employers etc. Investing in us now can only strengthen the foundation we provide that prop up both NHS and Social Services. Is the government prepared to take ACTION? This entry was posted on 14 June 2013 at 12:00 and is filed under adult care, Alzheimers, Carers, carers week. You can follow any responses to this entry through the RSS 2.0 feed. You can leave a response, or trackback from your own site. Despite Rosemary’s endeavours during the annual ” Time to dust off the cob webs , and seen to be seen ” ritual known as Carers Week , carers are no further forward than they were when various Carer run Carer Forums sprung up across the Internet over a decade ago. It’s a sad fact of life that carers , collectively , have ONLY one weapon , and like the dreaded nuclear deterrent , will never be used …. after all , to use said weapon would defeat the whole object as one’s existence in this Sad New World as a carer. Consequently , the annual ritual is little more than a collection of Oliver Twist type characters , all with good intentions , carrying their various beggars’ bowls asking , in that well worn phrase ,” Please sirs , can we have some mores … or should that be scraps ? “. Recent history demonstrates that this , unfortunately , is , indeed , the correct outcome of all endeavours todate. A full meltdown in the economies of the western nations may also lead to change but …. the causality rate amongst those unable to withstand the forces unleashed will be a bitter memory for future generations to mourn.